MSc Environmental Consultancy has proved very attractive to employers because of the vocational relevance of the teaching programme. You'll receive training and gain skills which are in demand in the environmental sector. Over half of our past graduates have secured employment within the growing environmental consultancy sector, working mainly on development-related impact assessment (EIA), particularly in the renewable energy sector. In addition to EIA, a large proportion of our postgraduates are finding employment as environmental managers, developing and implementing environmental management systems (EMS), aimed at natural resource protection, legal compliance and cost reductions. Our work placements have proved very successful with up to 20 per cent of graduates from our programme annually securing employment though their placement providers (Acorn Ecology, ARGANS, Marine Ecological Surveys, Penarth Management, Westcountry Rivers Trust and URS). Employers range from the small and medium-sized specialist ecological consultancies (Marine Ecological Surveys, Ecospan, FPCR architects, Hydrock and Thomson Ecology) to the large multinational engineering companies (AECOM, Hyder Consulting, RPS Group and Royal Haskoning). A small but significant number of our postgraduates find employment within voluntary and statutory environmental sectors, particularly the Environment Agencyfor those with interests in water pollution and coastal marine protection. Postgraduates from developing nations take advantage of the training provided at Plymouth in waste and water management, many securing employment with their respective governments in environmental protection. Previous employment successes build on the research expertise that Plymouth has in marine sciences, EMS, waste minimisation, evaluation of contaminated environments, environmental law, geographical information systems, planning policy and in ecological impact assessment. "As one of the UK’s largest environmental consultancies, we are always on the lookout for good graduates that can bring something new to the business." 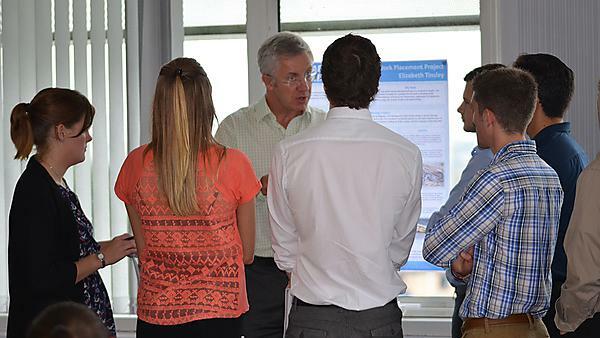 "WSP have had a long relationship with the MSc course in environmental consultancy at Plymouth and the course has provided lots of placement students for our technical teams – such as Ecology, Contaminated Land and EIA. Many have gone onto secure permanent positions with us and have risen through the ranks to become senior members of staff." "We've been recently recruiting for Marine Environmental Consultants. We have been very impressed with graduates from the MSC Environmental Consultancy programme at the University of Plymouth. We wanted to send our congratulations on providing students with an MSc that it so well-tailored for our industry. The placements provided, and the practical experience of undertaking an EIA, were particularly noted." Placements in the environmental sector will give you an invaluable insight into the environmental business sector and, in many cases, has led to permanent positions being offered by employers.